WANT TO DOWNLOAD THE WORKSHEET? I've had a client say to me, "I know you don't believe in Low Carb Diets... But it's the only way I can lose weight." "What a minute," I told her. "I don't believe in Diets. That means I don't believe in changing your whole life to something so restrictive that it's unsustainable. You'll inevitably go off of it and gain the weight back. That doesn't mean that I don't believe in finding a way to eat less carbs. But it must be in a way that feels do-able and sustainable. Most of my clients find that cutting back on carbs helps them lose weight and keep it off. That's one reason I recommend using the Real Healthy Habits Meal Template--It's lower in carbs, but you can use it long term." Recently, I had another one of those "I know you believe, but..." moments from a client. Just to clear things up, I decided to explain it to you too. A client texted me to say, "I know you don't care what the scale says, but I want to let you know that I've lost four pounds..."
Whoa, Nellie! I'm not sure how she got that impression. I guess I've got some clearing up to do. "That's not true. In fact, weight does matter," I texted her back. "But not for the reason that you might think...In fact, I recommend weighing yourself every day." "Phew, " she texted back. "I weigh myself everyday and thought I was a little crazy for doing that." I know you think that losing 20 pounds is your goal, but I bet that isn’t your "Real Goal." What if the earth’s gravitational force suddenly changed? Now you weigh 20 pounds less. Unless you're a wrestler trying to make weight, you wouldn’t have reached your goal. You made that weight loss goal because 20 pounds seems to be just about the right amount to lose to increase your energy, to improve your medical labs, to get to your pre-kid weight, to increase your confidence, or just to fit into your jeans again. Your "Real Goal" isn’t your weight. Your Real Goal is some way that you will feel better. So if your Real Goal is to have more confidence and more energy, what does your weight have to do with it? 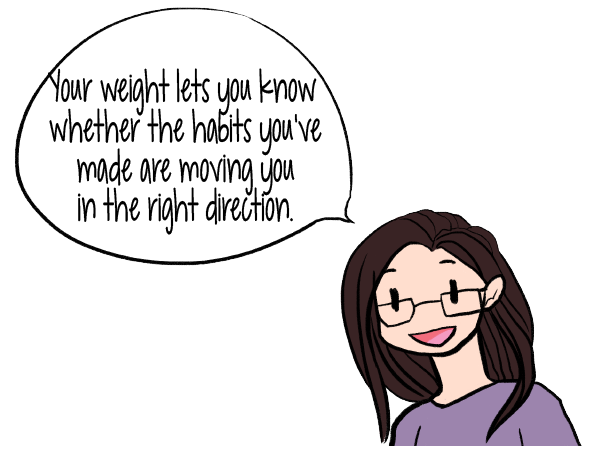 Your weight is an important feedback mechanism. My clients often get hung up on the number on the scale. You may have been focused on that magic number for a long time--for some of us it's been years, even decades. It's helpful to take a step back from the scale. Then ask yourself, "What would losing 20 pounds do for me or allow me to do? What is my Real Goal?" Identifying your Real Goal can drive your weight loss. Your Real Goal can keep you going when you feel like giving up. Knowing why you really want to lose weight can give you willpower reserves (bigger bucket of willpower) you never knew you had. I'm always talking about training the sub-conscious Assistant part of the brain to lose weight. But, first you have to get the thinking part of your brain, The Boss, motivated to lose weight. If the Boss isn't on board, then there is no way that weight loss is going to happen. That's why defining your Real Goal is super important. If the only reason you want to lose weight is to wear smaller jeans, it might not be a big enough reason to go through all that habit-changing hassle. However, when there is a super important goal at stake, the Boss part of your brain will realize that weight loss needs to happen for your Real Goal to be achieved. Weight loss is a step to reaching that Real Goal. Weight loss becomes and stays a priority. By identifying your Real Goal and reviewing it daily, you'll get in touch with the motivation that will keep you going on your weight loss journey--despite any obstacles or temptations. I have several strategies that I use with my clients to determine what their Real Goal is. 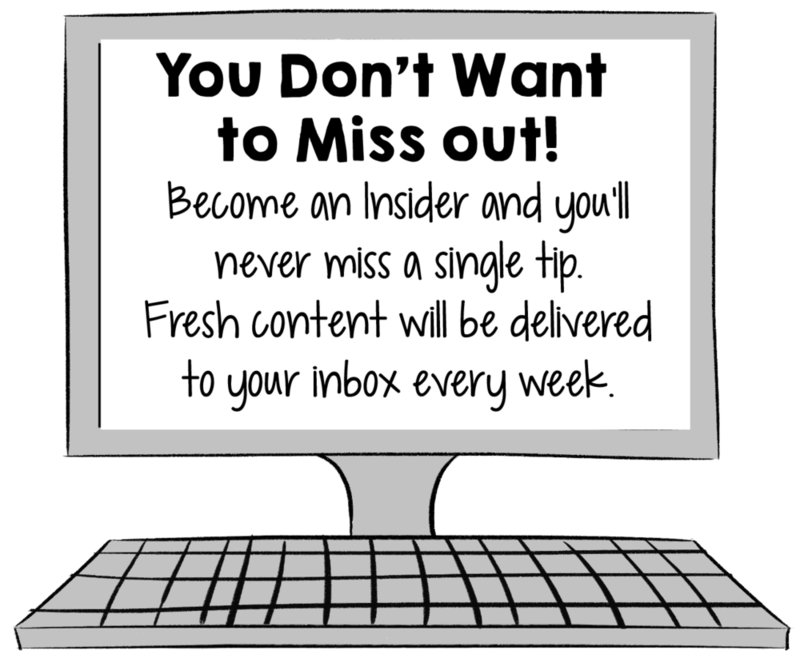 I'm going to share two of those strategies with you. The first strategy is called The 5 Whys. The 5 Whys or The Root Cause was a system originally used by Toyota to figure out what went wrong in the manufacturing process. It can be used in all kinds of ways to find your root cause/ motivation for any goal. I love to use this process with weight loss clients because it's simple, but it's powerful. Basically, you write down your weight loss goal, and ask yourself why that is important. Then you keep asking yourself "Why?" to drill down until you get to your Real Goal. This reveals why weight loss is so important to you. Change is not easy. But, look at the example above. 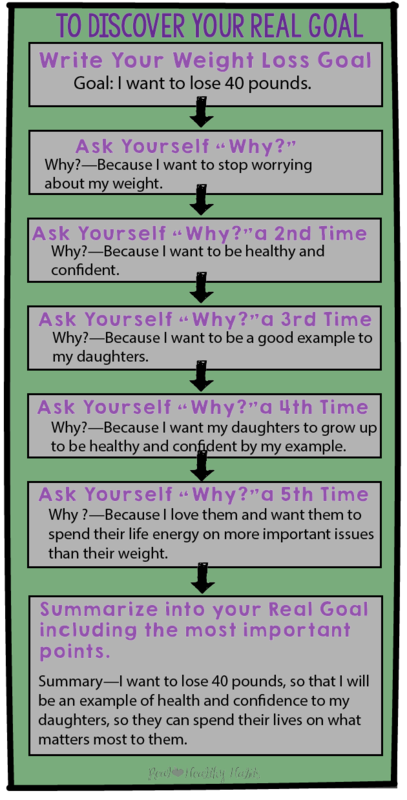 This was my 5Whys that I wrote out when I started on my weight loss journey several years ago. I had gained 40 very stubborn pounds during my struggle with autoimmune thyroid disease. Losing 40 pounds (check out the example above), so that I could become an example of health and confidence to my daughters was what sustained me when the weight loss "going" got tough. That was a Real Goal that both my Boss and Assistant could get behind. You'll want to give up at some point (or many times) during your weight loss journey. Identifying your 5 Whys, gets you in touch with your strongest motivation--your Real Goal. Your Real Goal will take weight loss failure out of the equation. It's not an option. You'll feel your willpower getting stronger and stronger. You'll keep up with your new habits day-in and day-out. Be sure to download The 5 Whys worksheet to help you discover your motivation to keep losing weight. Another strategy I use to help my clients identify their Real Goal is contained in this video about Jealousy. I've found that Jealousy is an excellent way to uncover your Real Goal. Also, jealousy can help you tease out smaller goals. These smaller goals--like hiking with your family, becoming a runner again, or growing a garden may help you lose weight and Enjoy Life More. Remember that Enjoying Yourself More is a fundamental pillar to the Real Healthy Habits weight loss philosophy. Check out the video to learn the four steps for how to use Jealousy to increase your happiness. It sounds weird, but it works. Want More Weight Loss Motivation? 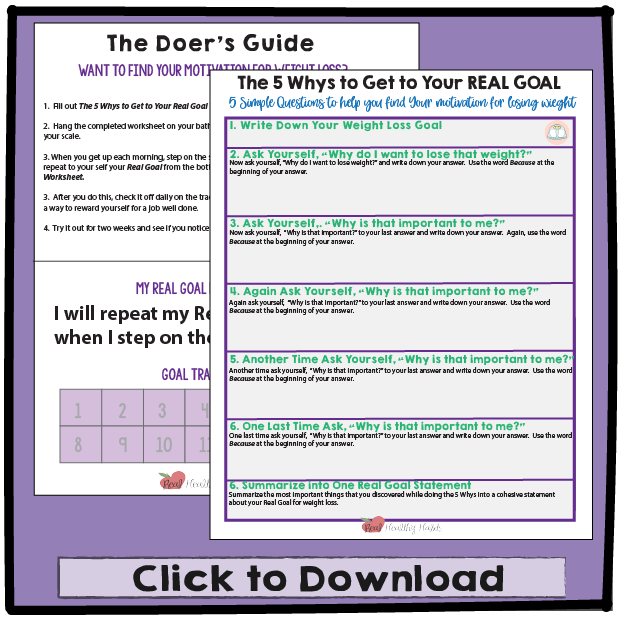 If you want to discover the motivation to keep losing weight even when things get hard, be sure to download The 5 Whys to Get to Your Real Goal Worksheet below.